A young Easterling soldier is forced to swear an oath to Sauron. Warning contains themes including human sacrifice, which some readers might find disturbing. The familiar characters and places belong to Tolkien and his heirs. Hulagu and his friends are my own invention. I make no money from writing this story. "So to love you that we may truly serve you, whose service is perfect freedom;" Augustine of Hippo.-Book of Common Prayer. Möngke did not deserve to die like this. Hulagu wanted to look away but dared not. He could feel the Noyan's eyes boring into him. Hulagu had no desire to share his comrade's fate. He tried to meet his friend's eyes, but Möngke was too terrified to look anywhere save at the priest's knife as it neared his throat. His naked body was spread-eagled across the altar and bound with chains. "May the Lord of Gifts bless us for this sacrifice!" cried the high priest. Möngke screamed. The scream was replaced by a hideous gurgling noise as his life blood drained away. Hulagu felt bile rise in his throat as tears pricked his eyes. He swallowed hard and stared at his boots. He was forced to look up again when the Noyan spoke, "Mark today well, for thus is the fate of all those who break their oaths and try to leave our Lord's service. The Lord of Gifts is merciful and granted him a swift, clean death. Those of you who are foolish enough to be captured by the Tarks will fare far worse. They will sacrifice you to their cruel gods by hanging you on a tree and leaving you for the ravens to devour piece by piece. Then they will ravish your women and kill your children if you do not stop them from crossing our borders." A visible shudder passed through the ranks of men. The Noyan continued, "But loyal men will spare themselves and our beloved land such a fate. Will you fight?" The men struck their spears on the ground and cried. "We will fight. Death to all Tarks!" The Noyan smiled slightly then said, "A great honour awaits a few of you today after the shame of Möngke's desertion. The high priest himself will consecrate those chosen as they swear allegiance to the great Lord of Gifts." His eyes scanned the silent ranks. He lifted his great spear and pointed "Köke, Hasi, Temür,Orus, Qara, Chagha'an, Esen, Alani, and Hulagu are the chosen ones. You are to go to the inner chamber of the temple where the priest will prepare you." The nine chosen men marched away led by Orus. The young man's eyes shone. He was known to be a devout follower of the Dark Lord, who offered sacrifices at every opportunity. Hasi was almost as devout. It was hardly surprising as his father was one of the Noyans who had brokered the alliance between the Easterlings and the Dark Lord to fight in this war. Qara was the son of another Noyan, now dead, who would whisper in the yurts at night that life as a soldier had been far happier when his father was the commander. Hulagu did not know the other young men well, apart from Alani who had also been a friend of Möngke. It seemed that few, if any, had been chosen by accident and the consecration was meant as either reward or punishment. For Hulagu it was certainly the latter. He had heard dark tales about ceremonies in honour of the Dark Lord; that they changed a man and ate away his soul. Möngke, Alani and he had always tried to avoid the public sacrifices since they had been brought here. At home they worshipped the Tengri. The Noyan had questioned him harshly when Möngke had left. He had pleaded ignorance of why his friend had chosen to leave, not wishing the Noyan to learn that Möngke's sweetheart had given birth to his son and he wished only to see the child before they marched away to fight the Tarks. The inner chamber was lit by flaming torches. A black robed acolyte greeted the nine men in the Lord of Gift's name and ordered them to remove their clothes. Hulagu shivered as he pulled off his tunic and breeches and not with cold, though a damp chill permeated the chamber despite the heat outside. Were they to be sacrificed to the Lord of Gifts too? His fear increased when the acolyte brought forth a great spear, which he stood holding, its tip pointed towards the men. Even Orus and Hasi looked apprehensive. Hulagu could not help but notice that the two young men had the symbol of the Eye carved into their shoulders. The acolyte told the men to form a circle around the weapon. Another two acolytes appeared, one holding a bowl and the other a knife. They were followed by the High Priest in his orange robes embroidered with the symbol of the eye. "All hail the Great Lord of Gifts!" intoned the priest. He stared at them intently making Hulagu feel highly uncomfortable. "Great is your bounty, mighty Lord, and many are your blessings. Today these unworthy supplicants are come before you to dedicate themselves to your service." Hulagu shuddered. He was standing beside Alani. The two young men shivered and tried to cover themselves with their hands. The priest then raised his arms aloft. Orus and Hasi did likewise. The acolyte glared at the other seven who quickly raised their arms as well. The priest then approached Orus with the knife. The young man fell to the ground in a swoon, but the acolytes dragged him to his feet. The priest then cried "Receive again the blessing of the Great Lord's mark!" He then carved the symbol of the eye on Orus' chest. He then moved round the circle, doing the same to each man in turn, varying the words according to whether they already bore a mark or not. The young men stood passive, fearful of what would happen should they try to resist. Hulagu tried not to flinch when it came to his turn. The cutting did not hurt as much as he expected it to, for the knife was sharp and the priest did not cut too deeply. He closed his eyes and tried to think himself elsewhere, back in his village as a child, tending the horses and the goats. He had never desired to leave his place of birth and take up arms. He was forced back to the present when the priest spoke again. "Let the blood of the sacrifice grant you strength and courage in battle!" Hulagu opened his eyes and saw that the bowl contained a thick red fluid- Möngke's blood! He felt as if he were going to be sick and swallowed hard as the scent of damp metal assailed his nostrils. His arms started to ache with the effort of holding them above his head, but he dared not lower them. He started to sweat despite the unnatural cold of this place. He glanced across to the other men. Orus seemed to have recovered himself while Hasi's eyes gleamed with something akin to ecstasy. At his side, Alani was visibly shaking. Again beginning with Orus, the priest dipped his fingers in the blood and sprinkled it copiously over Orus' skin. He went round the circle, doing the same to each man in turn. When it came to his turn, Hulagu sent up a silent prayer to Tengri that Möngke's spirit might be already far from this place and safe in the Spirit World, so as not to witness this desecration. The blood felt sticky on his skin and was still warm. The priest then cried, "Hallowed by the sign and cleansed by the sacrifice, you shall now take your oaths. One by one, you shall come forward and place your hands upon the sacred spear and repeat the words after me. You, boy, shall be the first." He gestured towards Hulagu, much to his dismay. The acolytes pushed him forwards on to his knees. He gripped the spear with trembling hands. At least lowering his aching arms provided some relief. The priest intoned, "By the sacred weapon, today I offer my life in service to the great and bounteous Lord of Gifts. I am his; body and soul and I freely offer my life in his great service until death take me. This is my solemn oath. Should I betray my vow, may my life be forfeit, my body utterly devoured and my name cursed amongst my people. So be it. All hail the Lord of Gifts!" Hulagu's throat constricted. He feared the Lord of Gifts, as nothing but unhappiness had come to his people since the alliance had been made and altars were built to him. It seemed that the gifts were not for simple villagers such as himself and Möngke. He wanted to run away far from here and return to his peaceful village. "Swear!" cried the priest. "Would you anger our bounteous lord?" Stumbling over the words, Hulagu swore the oath. It felt as if darkness was settling deep inside him with every word he spoke. He was then dragged back to re-join his fellows and made to raise his arms again. One by one the other eight spoke the words with varying degrees of enthusiasm. Orus was quivering with ill- concealed excitement when it came to his turn and he kissed the spear after speaking the words. When everyone had taken the oath, the priest dismissed them saying, "Go now and be victorious in battle, bearing the marks of consecration! In victory, you the chosen ones, shall rejoice before the Lord of Gifts' altar. Meanwhile, a special honour is bestowed upon one of you, to remain here and be of service." Hulagu found he was holding his breath. He let out a sigh of relief when Chagha'an was chosen. Orus and Hasi looked disappointed. Hulagu hardly knew Chagha'an who appeared unremarkable, apart from having fine looks that appealed to the village girls. Hulagu sighed with relief to finally be allowed to rest his aching arms and pull on his clothes. He badly wanted to wash away Möngke's blood and his own, but dared not. His arms throbbed and his cuts smarted, but inside he felt oddly numb. He hastened to his yurt and fell into an uneasy sleep filled with dark dreams of blood sacrifice. The next day they marched to war much to the surprise of them all. Some of the newer conscripts such as Hulagu and Alani had only just begun their training. Qara whispered as they set off that it was folly to go to war before they were fully prepared and his father would never have done such a thing. He said no more when he noticed the Noyan's eye upon him. Hulagu discussed the oath taking with no-one, not even Alani. Their comrades were curious as to what had happened, but after Orus had proclaimed it a sacred mystery, no-one asked further questions. They had learned it was not wise to enquire too closely into the rites of the Lord of Gifts. On the third day of the march, Hasi sickened and foul matter oozed through his tunic where he had been cut. By the fifth day, he fell from his horse and was left by the roadside to die. After that, Orus no longer offered every unfortunate creature he could catch to the Lord of Gifts. Hulagu wondered if he would meet a similar fate, but although his cuts itched they healed cleanly enough, leaving ugly scars upon his skin. Some of the men muttered their dismay that one of the chosen had been struck down, but the Noyan said it proved Hasi was not worth the honour bestowed upon him. The men grew weary and many horses went lame. It seemed that the land they were to conquer for the Lord of Gifts was a long march away. The Noyan told them the land was called Gondor and the men who dwelled there were cowardly and evil. As they marched nearer to Gondor they were joined by many other men from distant lands as well as legions of Orcs. Although Hulagu knew they were the most faithful servants of the Lord of Gifts, he found them highly repulsive. Their stench made him heave. Hard though the days of travelling were, Hulagu feared the nights far worse as the dark dreams continued to disturb his rest. He dreamt that a great beast was devouring him piece by piece and its fangs were dripping with Möngke's blood. When battle came, it was like nothing Hulagu could have imagined in his worst nightmares; the noise, the confusion, the clamour, the screams and the stench. Orus charged into the fray, crying "Glory to the Lord of Gifts!" Hulagu never saw him again as he was at once swallowed up by a vast host of men and horses. Hulagu knew he should follow his comrade, but he hesitated, almost paralysed with fear. A great golden-haired warrior, mounted on an enormous steed charged at Hulagu and knocked him from his horse with his spear. The animal kicked out in his terror as Hulagu hit the ground and he knew no more. Was this the Spirit World? Hulagu wondered. He had not expected death to hurt so much. The great beast was in this realm too, tearing at his flesh and sucking his soul away. He had thought his kinsfolk would be here to greet him, but he was alone in this pain filled void of terror. Sometimes there was light and water was held to his lips. He gulped it thirstily before returning to the darkness. Hulagu gradually returned to awareness. It seemed that he was still alive. He was lying on a sort of high couch in a sparsely furnished white room. His right leg was missing from just above the knee and his head and chest throbbed painfully. Black robed men tended to him, but they appeared to be medicine men rather than acolytes. They gave him vile tasting potions to swallow but also brought him food and water. The food was plain and tasted strange to him, but seemed wholesome enough. He was bathed each day. They had taken his clothes and he was now garbed only in a long linen shirt. Hulagu was not treated unkindly, but he was terrified. His captors were brisk and efficient. He knew they would sacrifice him to their gods and wondered why they delayed. He would have asked them, but they seemed not to understand a word he said. Some of them knew a few words to enquire of his basic needs such as "water", but that was all. One day, an old woman came to dress his wounds. She chattered away incessantly, seemingly oblivious to his lack of comprehension. It was good to hear another human voice, though, and her face was kind. She reminded him of the old medicine woman in his village. Hulagu wondered if any of his fellows had survived. He wondered whether they had been slain on the battlefield or sacrificed to the Tark gods. He had no idea why he was still alive. Days passed, merging into weeks. He had no idea how long he had been in this place. The nightmares continued to torment him every time he slept. Sometimes his screams brought the medicine men, who would dose him with more evil tasting potions which caused him to sleep. The days grew longer and Hulagu could tell the medicine men were excited about something from the animated way in which they spoke and the smiles on their faces. One day, he could hear bells ringing and trumpets blowing and the sound of cheering in the distance. His fear increased. At home, such festivities preceded a great sacrifice. They would surely come for him soon. Several days passed, Hulagu was unsure how many as all days were alike in this place. The door of his room opened and instead of one of the black- robed medicine men or women, a stranger entered. He was exceptionally tall and had the air of a warrior about him, though he was simply clad in a grey cloak over a well cut tunic and trousers. On his breast, he wore a brooch shaped like a bird and set with a great green stone. Hulagu was terrified by this new arrival and cowered under the blankets. The stranger seated himself on the chair beside Hulagu's couch. "Greetings," he said in a heavily- accented version of the Easterling tongue. "How do you fare?" Hulagu was too frightened to reply. The stranger continued, "Do you understand me, lad? You are an Easterling, are you not?" "As I can speak your tongue, the healers asked me to speak to you as we need to decide what to do with you now the war is over," said the stranger. "What is your name, lad?" The stranger smiled. "A fine name and in your tongue it has a similar meaning to my Steward's name." "I know you mean to sacrifice me, so do it quickly, please!" Hulagu started to babble in his terror. "Cut my throat, but do not let the crows slowly devour me!" The stranger stared at him with an expression of horror. "Sacrifice you? Feed you to the crows? What do you take us for, lad? Savages?" "I am your prisoner. Prisoners are sacrificed. It is the custom." "It might well be your custom, but it is certainly not ours!" The stranger's tone was sharp then softened. "My comrades are all dead?" Hulagu asked sadly. "By no means," said the stranger. "Many of your folk fled from the field when the battle turned against them. Others were taken prisoner or wounded and brought here. The Healers tell me that two of your comrades came to your bedside when you were unconscious. They think they were friends of yours, but we could not understand what they were saying." "Alani and Qara?" Hulagu cried, his eyes lighting up. "They are in this place?" The stranger shook his head. "One was healed of a broken arm and the other had broken ribs. They have gone home to their people now. Those of your people we captured, we sent home once Sauron was defeated. You are still here in the Houses of Healing as your injuries were too severe for you to travel. The healers say it is a marvel you survived with a fractured skull, crushed ribs and a crushed leg. Sadly, they could not save your leg, but your ribs and head are almost healed they tell me." "Why save your enemies?" asked Hulagu. "The healers are sworn to treat all the sick and injured who are brought to them," the man replied. "When we searched the battlefield, you were found beneath a pile of corpses, still breathing, so we brought you here to heal. Now we have to see how we can send you home." For a moment, Hulagu's heart soared. Then he glanced down at where his leg used to be and remembered. "There are no men in my land missing a leg. I would be seen as cursed, a bringer of ill luck." "Have you no family to protect and care for you?" the stranger asked. "My parents died when I was young. An old woman in my village raised me for I had no other kin." The stranger looked grave. "I would suggest that you remain here, but the healers tell me you carry the mark of the lidless eye over your heart." He reached across and placed a hand on Hulagu's brow. "I sense a darkness within you too. I care not whom Men worship, save one. I will have no veneration of Sauron and his evil in my lands. Though he is no more, his evil lingers in some hearts and causes discord." Hulagu regarded the man in wonder. "The Lord of Gifts is no more?" "He was utterly defeated and his spirit carried away on the winds," said the stranger. "But tell me, are you one of his followers?" "I am sworn to him body and soul, even though I worship Tengri," Hulagu said bitterly. "There were nine of us, the chosen ones. I never asked to be chosen. I am not even a soldier; I'm a potter's apprentice. I wanted to make pots, not kill people!" The stranger regarded Hulagu with piercing grey eyes that seemed to pierce deep within his very soul. "Tell me about it," he said. Hulagu thought it would be hard to speak of that dark day when he was chosen, but once he began he found the words came tumbling out in a vast torrent. He described the sacrifice of his friend, how he came to be chosen and the way he was marked with the Eye and then consecrated with Möngke's blood. The stranger listened intently. Hulagu could not bring himself to study his expression. He could all too easily imagine the contempt and disgust he would find there. The stranger did not interrupt. He only spoke when Hulagu had concluded his story. "Would you permit me to see the mark?" Hulagu looked at him in surprise. This was the very last reaction he had expected. He was puzzled that it was a request rather than a command. He hesitated. There was something noble in this man's bearing and the mark made him feel unclean. Nevertheless, he nodded and pulled the shirt he was wearing over his head. He glanced down at the mark. He had had suffered numerous cuts and bruises from the battle. They had faded, but the mark of the lidless eye still stood out livid against his skin. "Lie down," the man instructed him. Hulagu did as he was told. The stranger's face was expressionless, reminding the boy of the many medicine men who had tended to him. Maybe this man was one of them, though he seemed to have more of the air of a warrior. He placed his hand on the mark and only then did his neutral expression falter. The feeling of heaviness that had plagued Hulagu for weeks seemed to increase and he felt as if something were slithering around inside him. He started to tremble. The stranger removed his hand and pulled the blankets over the boy. His expression was grave. "There is indeed darkness within you," he said. "It torments you; body and soul. I believe I can help you, though, if you would permit me." "Dark dreams disturb my sleep each night," said Hulagu, surprised that the stranger seemed to know this. "I want them to go away." "It might cause you some discomfort to cleanse you," said the stranger. "It is the only way to free you of this evil, though. This mark was sealed with a cruel blood sacrifice which trapped the darkness within you, even though Sauron is no more." "I swore a blood oath too," said Hulagu. "Did you swear it of your own free will without any coercion, though? From your story I think not." Hulagu nodded. "I was too afraid not to swear the oath. I yearn now to be free of the darkness." He shuddered, though as he spoke, wondering just what the stranger would do to him. Maybe he would cut the mark off or burn it with fire? Hulagu hoped he could be brave. The stranger went to the door and called for hot water. A few minutes later, the talkative old woman appeared with a bowl of steaming water and several cloths, which she placed on the table beside Hulagu's couch. She smiled at him reassuringly as the stranger dismissed her. The stranger fumbled in his tunic and brought out two long slender leaves which he crumbled into the steaming water. A fragrance filled the air, which reminded Hulagu of his life before he had been made to become a soldier. His heart suddenly lightened, but only for an instant before the heaviness returned. The stranger pulled back the blankets to reveal the mark again. He spoke words that Hulagu could not understand. He then dipped his hands in mixture in the bowl and placed both hands over Hulagu's heart where the mark was. Hulagu cried out as a searing pain shot through him, followed by a writhing and pulling sensation. The stranger's face seemed contorted with pain too. After what felt like an eternity, but must only have been a few minutes, he removed his hands. The mark looked angry and inflamed. Hulagu could hardly believe his eyes when something that looked like black smoke began to rise from the mark. The stranger rushed to the window and threw it open. The black smoke drifted out of the room and dissolved into nothingness and with it went the sense of heaviness that had plagued the boy for so long. The stranger took one of the cloths and dipped it in the mixture and placed it on Hulagu's chest. A living freshness filled the air. For the first time in many months, Hulagu began to weep. Every emotion that had been buried within him; grief for Möngke, being forced to take part in the ritual, the loss of his leg, and being wrenched from his homeland came pouring out in a torrent of weeping. As well as the sadness, there was also an overwhelming sense of joy and relief. The stranger said nothing. He wiped away Hulagu's tears with a clean cloth, then placed a comforting hand on the boy's shoulder. He did not speak until Hulagu's tears were spent. He then placed a hand on the boy's brow and smiled. "The darkness has left you. You are cleansed from it. Do you feel better now?" Hulagu nodded and a smile spread over his features. "I do. You have powerful magic, sir. Are you a shaman?" The stranger shook his head. "The power of healing is in my blood, though I was taught by the Wise how to use it to fight the darkness." He removed the cloth that covered the mark of the Eye. Hulagu was astonished to see that the mark was fading before his eyes. "You are free now, Hulagu." The stranger handed him his shirt to put on again. Hulagu's smile faded. "The oath I swore was until death. I am cursed by breaking it!" "A vow sworn under duress is not binding," the stranger said firmly. "However, as an oath to an old lord now dead may be replaced by an oath to a new lord, you could swear a new oath in due course if you wished." With a gesture of his hand, he silenced Hulagu from replying. "Think about it, as this time it must be of your own free will. I will return on the morrow. Until then, let your heart be easy." With that he left the small chamber. As soon as Hulagu was alone, he felt very tired. The old woman returned and took away the bowl and cloths. She then brought him food and drink. After he had eaten, he fell into a deep and dreamless sleep for the first time since the ritual. The stranger was as good as his word and returned the next day. He placed his hand on Hulagu's brow and smiled. "There is no darkness within you now. 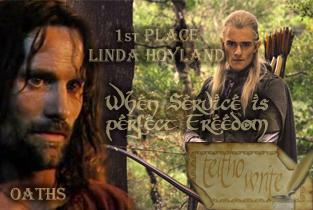 You are free to dwell here in Gondor." "I would like to swear a new oath," Hulagu told him. The stranger smiled. "I thought that might be your choice, but first you must recover fully and learn our language so that you can speak the words and understand them. The healers will teach you how to walk on crutches. There is a potter in the fourth circle who lost his apprentice in the war and would, therefore, be willing to employ you when you leave the Houses of Healing. You would receive a small wage and your bed and board. What say you?" "I should like that," said Hulagu. "I was happy when I was making pots." A sudden thought struck him. "But I have no clothes to wear!" The grey –cloaked man's eyes twinkled. "Have no fear, Master Hulagu, the healers will not send you out into the world clad only in your nightshirt! Clothes will be provided for you before you leave your bed here." Hulagu heaved a sigh of relief. "Thank you, sir." "You can make a new life here," said the stranger. "It will not be easy, but I believe in time you will be happy here." He squeezed Hulagu's shoulder. "Farewell for now. We will meet again." The stranger had been right. Building a new life was far from easy for Hulagu. He persevered, though. First, he had to learn to walk on crutches, a slow, painful and laborious process. Once he could totter around the Houses of Healing without falling flat on his face, the healers pronounced him fit to leave. At the same time as he learned to walk again, Hulagu sought to learn the tongue of the people he was now living amongst. Two guards came with a litter and carried him through the city to the potter's house. Hulagu had never seen anything like Minas Tirith with its splendid stone buildings and crowds of people. The potter, Master Hador, was a kindly man who gave Hulagu a small chamber on the ground floor next to the workshop. He was interested in learning about styles of pottery from Hulagu's homeland as well as teaching him how to make pottery in the style of Gondor. His whole family made pots, including his pretty daughter who was about Hulagu's age. Hulagu enjoyed his work and his master was understanding and would let him rest when his injuries pained him. Weeks passed into months and the seasons passed. Hulagu rarely left the potter's house. He found the steep streets difficult to navigate on crutches and many folk looked at him in a less than friendly fashion. Some days he felt very sad, especially when he missed his homeland and his friends and after he had nightmares about his time as a soldier. These were ordinary nightmares, though, and nothing like the dreams that had tormented him before. Sometimes, he woke up feeling sad after dreaming of his childhood when he had played with the other boys in the village. Other days, he was in pain when it seemed as if his right leg was still there and throbbing uncomfortably. His scars had healed, though, and the mark of the Eye had faded completely. His life was far better than he could have hoped, however, and he enjoyed his work. He often thought about the stranger. He wondered about who exactly he was. Maybe he was a Noyan, but he also seemed to be a healer and a magician too. He asked Master Hador if he knew of any magicians. Hador said he did know of a wizard called Mithrandir, but he was an old man and had a long white beard. One winter's morning at breakfast, which Hulagu ate with Hador and his family, the potter was in a happy mood. "I have received a message to say that the King is coming here today with Queen Arwen and the Steward," he said. "He likes the plates I've been selling with the design of the White Tree and would like me to make him some special ones." "I will bake a special cake for them," Hador's wife said. The Potter's daughter, Adanel, glowed with excitement. "They are truly coming here, Father? I've heard the Queen is the fairest lady that ever lived. I shall wear my best gown." Hulagu felt greatly unsettled by the tidings. In his land, kings were fierce, proud and unpredictable. One false move could lead to instant death. He doubted that this king would look on him kindly, a foreigner and former enemy. "Please may I stay in my room, Master, while they are here?" he begged. "Don't you wish to meet our visitors, lad?" said Hador. "I don't know the King and Queen, but Lord Faramir is a good man. I believe it is thanks to him that you came to me." Hulagu looked puzzled. "I have never met the Steward." "Just before the coronation, Lord Faramir toured the City and met with us craftsmen," Hador explained. "He asked us about our losses during the war and I told him that my apprentice had been killed by a chunk of falling masonry. Not long afterwards, I was asked to take you in." "For which I thank you from the bottom of my heart, Master. I'm sure Lord Faramir is a good man, but please don't make me meet them!" "As you wish," said Hador. He took a swig from his mug. "But enough talk, we must finish breakfast quickly if we are to be ready when the royal party arrive." Hulagu retreated to his room as soon as Adanel excitedly announced that she could see the visitors approaching. He took with him charcoal and parchment to sketch some new designs. He was far too frightened to concentrate, though. He had not only borne arms against this King, but had been pledged to the service of the Lord of Gifts. The So- called Lord of Gifts, he mentally corrected himself. Sauron had brought him nothing but a lost limb and exile from his homeland. A tap at the door roused him from his reverie. Hador's voice called out. "Hulagu, the King wishes to see you!" Hulagu's heart thumped like that of a frightened bird. He wanted to flee or to hide, but there was no room under the bed and only an able-bodied man could have climbed out of the small window. "Come Hulagu!" Hador pushed open the door. "There is nothing to fear. The King seems a kindly man, much like Lord Faramir. He is most insistent that he wishes to see you, though." Hulagu could do nothing, but take up his crutch and follow Hador out into the workshop. Three people were standing beside the potter and his family; a woman so fair that it almost dazzled him to look at her, a grave young man, and the man he still thought of as "the stranger". Today he was far more finely dressed and wore a fur lined cloak, but the same brooch set with a green gem adorned his breast. "Greetings, Hulagu," he said. "It gladdens my heart to see you much recovered. Master Hador tells me he is well pleased with you, while his wife is pleased you appreciate her cooking." Hulagu could only stare at him in mute astonishment. "I am certain you have much to speak of to my apprentice, sire," said Hador. He led the way out of his workshop followed by his family, the Queen and the Steward. Hulagu was left alone with the man he belatedly realised was the King. "I am sorry, great lord, I did not know." Hulagu tried to kneel and almost overbalanced. The King hastened to help steady him. "How could you know?" asked the King. He placed a reassuring hand on Hulagu's shoulder. "I am Aragorn Elessar, king of the Reunited Kingdom, but I was a healer long before I was a king and I still assist the healers when I am able. But tell me, Master Hulagu, how do you fare now?" He gestured to a chair. Hulagu sat and Aragorn took a chair beside him. Hulagu told him of all that had happened since their last meeting and that although memories and pain troubled him at times, he was well- content with his life with the potter and his family. "Yet you looked terrified when I sent for you. Why should that be?" asked the King. "I am happy here, but I once was sworn to the false Lord of Gifts," said Hulagu. "I feared you might see me as an enemy." "There will soon be a treaty between your people and Gondor," said the King. "Once, though, you said you wanted to swear an oath to a new lord. Do you still wish that?" "I do," said Hulagu, "with all my heart." Half an hour or so later, everyone was gathered in Hador's living quarters. Hulagu was frantically trying to memorise the words he was supposed to say. "Usually, one would kneel to take an oath and swear upon a weapon," said the King, "but you may stand, Hulagu, and as you are not offering military service, we simply clasp hands." He moved to the centre of the room and his Queen came to stand beside him. Watched by the Steward and Hador and his family, Hulagu offered his right hand which the King grasped as he said , "Here do I swear fealty and service to Gondor, and to the Lord and King of the realm, to speak and to be silent, to do and to let be, to come and to go, in need or plenty, in peace or war, in living or dying, from this hour henceforth, until my lord release me, or death take me, or the world end. So say I, Hulagu the Easterling." "And this do I hear, Aragorn son of Arathorn, Lord and High King of Gondor, and I will not forget it, nor fail to reward that which is given: valour with honour, oath-breaking with vengeance; fealty with love." He grasped Hulagu's hands between his own. "Now you are sworn to my service, Master Hulagu, and I am sworn to protect you as if you were born my subject. The past is now behind you and you may dwell within my lands in peace and freedom." Hulagu's eyes pricked with unshed tears. By binding himself he was at last truly free. B2MeM Prompt and Path:Wild “The sky grew darker, painted blue on blue, one stroke at a time, into deeper and deeper shades of night.” Haruki Murakami. Purple Path. Warnings: Racist and disabled abuse. Mention of childbirth. Pairings:OMC/OFCFor elenbarathi and virtuella who wanted more of Hulagu’s adventures. Hulagu sighed as the two youths came around the corner. He tried to make himself as inconspicuous as possible, but it was to no avail. “Cripple!” cried one youth, a scrawny lad who could not have been older than fifteen or so. “Foreigner!” cried his companion, who appeared slightly older and was more heavily built. “Crawl back where you came from, beggar!” cried the scrawny lad. He bent and picked up something from the gutter. Hulagu stumbled as he tried unsuccessfully to dodge the handful of mud thrown at him. He hobbled back to the safety of the potter’s workshop. It was always the youths who gave him the most trouble. The women simply looked the other way. whereas most of the older men had fought too and knew it was only good fortune that had spared them from his fate. They mostly met his eyes when they passed in the street, brothers in shared suffering, even though they had fought in opposite sides of the conflict. “Hulagu! What has happened to you?” Adanel, the potter’s daughter enquired. She was sitting at her bench painting a plate when Hulagu entered. “Um, I fell,” Hulagu muttered. Hulagu nodded mutely then did as he was bidden, then went outside to the potter’s small walled garden. He sat down on the bench outside the door and stared up at the heavens. The sky grew darker, painted blue on blue, one stroke at a time, into deeper and deeper shades of night. He loved watching the evening sky then trying to recapture its changing hues in the pots he made. Tonight, though, it was hard to concentrate on thoughts of creating beautiful things. The jeering youths had darkened his spirits until they were blacker than the night sky. Was he doomed to be forever an outsider? When he looked in the glass he was painfully aware of his slanted dark brown eyes, high cheekbones, olive sallow complexion, and dark brown hair. He looked so different to the men around him. Yet, Gondor was his home now. He loved his work at the pottery. Master Hador was a kindly master and his daughter was surely the fairest and kindest maiden that had ever drawn breath. His mood lightened as he thought of how concerned she had been for his well- being when he had come home with mud all over his garments. She appeared to be furious with his assailants. Did that mean she cared about him, or was it just because she had a kind heart? How could she ever care for a man from a far- away land with only one leg? He heard a rustling beside him and looked up. Adanel was standing beside him. “Of course, Mistress Adanel.” He moved to let her sit beside him. She smelt of spring blossoms, paint, and clay. “I suppose there are not many one-legged Easterlings in Minas Tirith.” Hulagu laughed wryly. Adanel moved closer, her face tilted towards Hulagu’s. Overhead the stars pierced the inky blue blackness. He kissed her. “I’m so sorry, Mistress Adanel.” Hulagu reached for his crutch to walk away. “I am not sorry.” Adanel cupped his face in her hands and kissed him tenderly on the lips. He kissed her back. Again and again. “He has?” Hulagu could hardly believe his ears. “He loves you as a son, as does my mother. Let us ask for his blessing now,” said Adanel. Leaning on his crutch, Hulagu limped along the street with Dame Ioreth at his side. Since that wonderful day two years ago, when the King had publicly hand-fasted him to Adanel, the taunts and jeers had ceased. He was no longer a penniless foreigner, instead he was the potter’s son in law and heir, favoured by the King. And now he was going to be a father. “How far apart are your wife’s pains, Master Hulagu?” Ioreth demanded. “You were kind to me during those days and I thank you,” said Hulagu. Hulagu could only hope the baby would not arrive before Dame Ioreth finished her story. He need not have worried, though, as the hours wore on and still his wife laboured in their chamber attended by her mother and Dame Ioreth. He had been banished to the pottery where he sat mixing dyes the colour of the midnight sky. He thought he would make a special plate and engrave their child’s name upon it. Unable to concentrate, he went to the window. It had grown dark and the sky was a clear midnight blue like on the night he and Adanel had declared their love. The stars twinkled in the night sky. Just then a baby’s cry pierced the night air. Hulagu still stared at the sky as if transfixed. Hulagu turned away from the window. He was certain that the stars were dancing. A/n The words of the oath (slightly altered) are taken from "The Lord of the Rings by Tolkien. Hulagu's culture is loosely based upon that of ancient Mongolia. A Noyan was a military commander or other high ranking official. Tengri was the supreme sky god.